Last week a customer who recently completed a kitchen remodel sent us some photos. Her kitchen is amazing! She shows how just a few of Avente’s Sculptural Relief Tiles create an eye-catching kitchen backsplash. The Diamond Medallion Relief Tile is used as accents spaced along the backsplash. Appalachian Spring Glaze was used for this project. 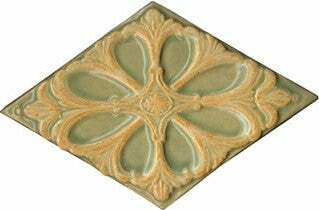 This large tile (10.5” x 7”) is shown below. When it comes to decorative tiles, one of my mantras (and blog posts) is that with Deco Tiles: A Dab Will Often Do! A few weeks ago Interior Designer, Lisa M. Smith of Interior Design Factory, showed us how to Get the Most from Decorative Tile. And, now our customer in Wyoming really brings this point home.